Brighouse Town are keen to "ensure the certainty and security of ongoing football" on the site at St Giles Road, following its proposed sale yesterday afternoon. The freehold of the seven-acre sports ground in Hove Edge which is occupied by Brighouse Town, has been offered for sale by the liquidators of Blakeborough Sports and Social Club. Blakeborough Sports and Social Club entered liquidation in 2015 and the liquidators, Begbies Traynor, have already sold the the freehold properties of Albion Bowling Club and the social club on Bradford Road. The sports ground is the final asset to be realised but is currently subject to a 25-year lease to Brighouse Town FC, dating from 2001. And Brighouse say there are no short-term effects on the current operation of the football club. A statement from chairman Charles Tolley read: "As people will now be aware Walker Singleton, under the direction of Begbies Traynor Corporate Recovery and Professional Services, have invited interested parties to put in bids for the purchase of the land at St Giles Road. "We have been kept fully aware of the actions and developments and have an open dialogue with Walker Singleton regarding the matter. "The course of action provides both an opportunity and a threat to the football club but in the short term does not affect its ability to continue operating from the site under the protection of the existing and operating lease. "There has been a background of uncertainty regarding the ongoing ownership of the site for the last 10 years and this current course of action will at least provide more certainty." Tolley feels that the current facility needs to be enhanced and has stated that Brighouse have declared their intention to be outright purchasers of the ground. 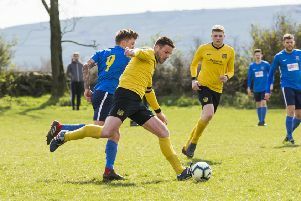 He continued: "It is a crucial and well-used facility for Calderdale School football, local district league cup finals and provides a community resource for several annual fundraising initiatives. "It is a Calderdale sporting facility that needs to be retained and enhanced and the club are hoping that the sale process will result in this. "The club have already indicated their wish to be considered as potential outright purchasers or as part of a joint initiative that would ensure the certainty and security of ongoing football on the site. "We are exploring all opportunities and eventualities relating to funding any potential purchase and would invite any investors who share the same ambition and who might wish to partner with us to get in touch."